Almost all of the 11 0,000 nuclear refugees, who were forced to evacuate areas near the Fukushima Daiichi plant have at times felt compelled to return to their homes, schools and businesses. When they did, they struggled to recognize places that had once been so familiar to them. Damages from earthquake and tsunami of March 2011, years of absence and the arrival of rodents have rendered the buildings practically unrecognizable. 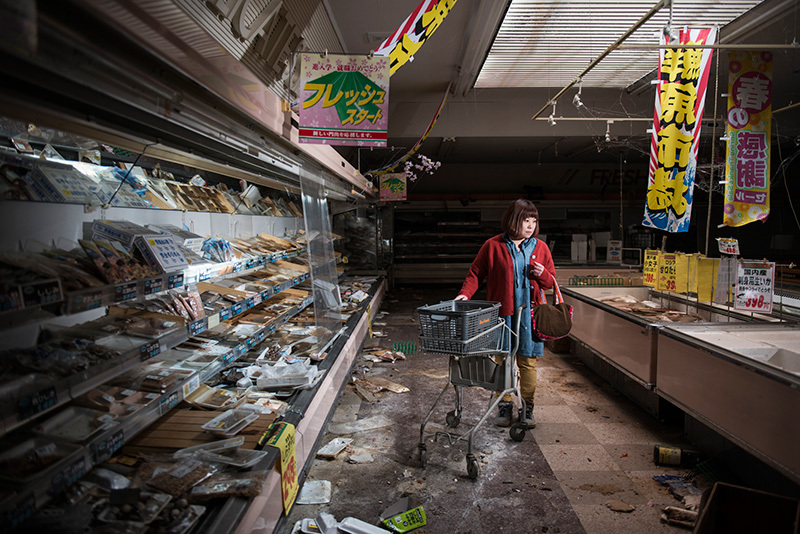 We asked former residents or inhabitants from the Fukushima region, and in some cases, the actual owners of certain properties, to join us inside the no-go zone and open the doors to these ordinary, but now unfriendly, places. Facing the camera, they were asked to act as normally as possible – as if nothing had happened. The idea behind these almost surreal photographs was to combine the banal and the unusual. The fact of the historical nuclear accident gives these images a real plausibility.